More than two years are needed to prepare six community radio in Kyrgyzstan, and administrative barriers in licensing cause internet broadcasting choice. EU and the UN project supports the opening of community media, decided to take advantage of mobile technologies for the production and dissemination of rural programs. The advent of force majeure suspends of broadcasting licensing for new community radios in Kyrgyzstan, since October 2013. Consultants of Media Consulting Foundation prepared to launch six community media - completed registration in the judiciary and provide a platform for obtaining a license. The project is promoted the Association of Community Media initiative in lobbying the issue of making in the Kyrgyz Law "On Television and Radio Broadcasting" the new concept of the "Community Media Organizations." The project selected six communities (Jamaats) from 6 regions, who had tried in 2012 to get a license for broadcasting and frequency assignment to open a radio station, but failed because of the administrative barriers in registrations. CR "Tun-yk" - Baetov village, Baetov ayil-akmaty, Ak-Talin region, Naryn oblast. Project consultant helped to prepare to six community radios the platform for obtaining broadcasting licenses. Due to the adoption of the Kyrgyz parliament the new Law "On licensing system in the Kyrgyz Republic" in October 3, 2013, the procedure for obtaining a license was suspended for an indefinite period. Accordingg to State Communication Agency: "Once issue of licenses will resume - all six community radio stations serving its applications for a license." On 29-30 July 2013 in Bishkek was held seminar on the basics of registration for heads of community radio broadcasters. Seminar informed and clarifies the basics of registration, of legal entities, the legal conditions for functioning of radio. Participants were introduced to the basics of the law and the requirements to the statutes, the contenders for the license. In the period before and after the seminar personal consultation allocated to each of six community media leaders via e-mail and phone to re-register the organization as a legal entity and registration the community radio as the media, as well as advice on the basics of licensing. MediaConsult Public Foundation in cooperation with Association of Community Media (ACM) are lobbying the new concept "community broadcasting’ into the Kyrgyz Law "On Television and Radio Broadcasting". In cooperation with ACM formulate the article of the law defining the status of community radio and television. This thesis was framed as a suggestion and officially submitted to the Ministry of Culture, Information and Tourism of the Kyrgyz Republic. Draft amendment currently under consideration by public authorities. Proposals made to amend the existing norms of the Law "On Television and Radio" in determining the status of the public broadcaster. The draft amendment is adopted, but is considered by public authorities without enthusiasm. Most of the public meetings to discuss the development of community media were held in the framework the EU and UN joint social justice project supported by UNESCO. In addition, during discussions on the possibility of changing the rules on public broadcasters often quoted UNESCO recommendations, which helped to promote the interests of community media. Given that the project will be completed in October 2014, the EU and UN project management team decided not to wait for receiving analogue licenses. Station will use mobile ICTs for the production and distribution of digital audio narrowcasting programs based on CMC equipment provided by DW Aсademy. UNESCO Almaty is providing special mobile software for receiving of audio podcasts produced by CMCs to villagers. 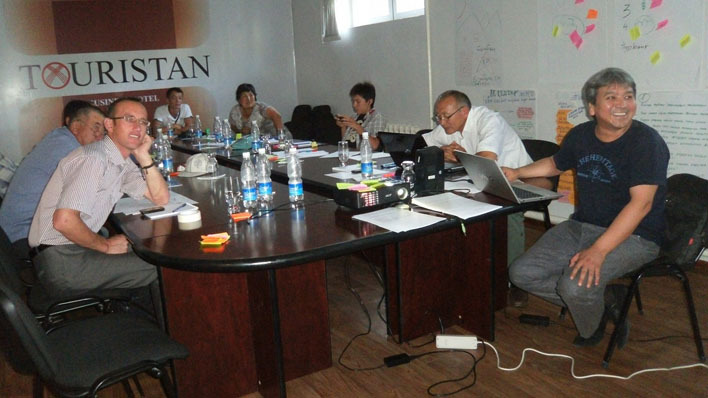 An activity launched by MediaConsult Public Fund within the UN Joint Project “Operationalizing Good Governance for Social Justice in Kyrgyzstan” which was launched in October 2011 and is carried out within 36 months to October 2014. The project aims to increase the capacity to implement the just rights of citizens to public services, especially for vulnerable groups - women, youth and children in 30 rural municipalities in seven regions of Kyrgyzstan . This project is implemented by UNESCO, UNDP, UNICEF and UN Women. The European Union participates in the financing of this project, together with the above-mentioned UN agencies.